Lego’s Speed Champions line of sets already has an impressive roster of classic and contemporary race cars like the Bugatti Chiron and the original Ford GT40. According to Lego enthusiast site The Brothers Brick, Lego has expanded their garage to include at least nine new models. One such new set are two Porsche 911s, the 911 RSR and the aircooled 911 Turbo 3.0 in a wild green color. 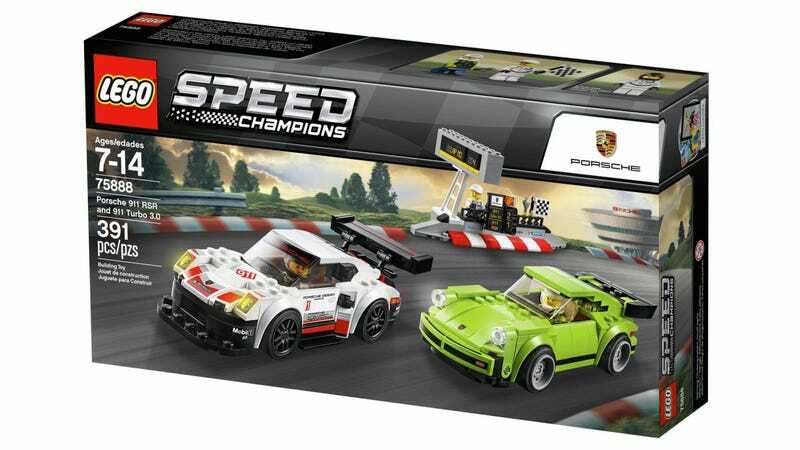 I think I just became a Porsche 911 fan, if only for the Lego sets. Keeping with the Porsche theme is a new set that features the Porsche 919 LMP car. At least this one won’t have the hybrid drivetrain fail halfway through the race. On the historic end is a 1968 Ford Mustang fastback set. This set includes a replica 1/4 mile drag strip clock so you can brag to your friends that you technically have a Mustang that runs nines. Next is a set called the Ferrari Ultimate Garage and includes a Ferrari 488 GTE, a Ferrari 312 T4 and the legendary Ferrari 250 GTO. Although pricing has not been released for the United States, I doubt this GTO will cost millions of dollars. This may be the cheapest way to build a racing team.